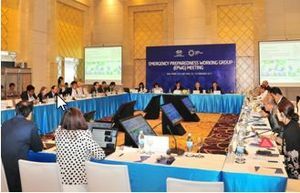 The first meeting of APEC Emergency Preparedness Working Group, EPWG in 2017 was held on 18 and 19, February, at Nha Trang, Vietnam. The meeting was opened by the welcoming remarks by Mr. Tran Quang Hoai, Vice Director, Directorate of Water Resources, Ministry of Agriculture and Rural Development, Vietnam, and Mr. Le Tan Ban, Director General of the Department of Agriculture and Rural Development, DARD of Khanh Hoa Province also gave his welcoming remarks.ED of ADRC participated in the meeting as one of the co-chairs and expressed words of thanks for the warm welcome, followed by the speech by another co-chair, Dr. Le Quang Tuan, Vietnam.From Peru, host economy of the year 2016, the Honorable Mr. Alberto Manuel Lozada Frias, Head of National Institute of Civil Defense, INDIECI, gave his message through video, due to a severe flood presently affecting Peru. This year, the host economy proposed to explore "Advanced Science and Technology to live with "New Normal" and Mr. Van Phu Chinh, Director General, Department of Natural Disaster Prevention and Control, Directorate of Water resources, MARD, Vietnam moderated the discussion for the agenda item. Dr. Le Quang Tuan gave a brief introduction on the issue and also raised the challenges to enhance resilience to face 'New normal' of coastal deltas by fostering Science Technology innovation. Many other ministries provided inputs and then other economies including Singapore, Chinese Taipei, Philippines, China and Indonesia presented their diverse experiences of using high technology for DRR, followed by the inputs from international organizations and private sector including those from Asian Disaster Preparedness Center, ADPC, Pacific Disaster Center, PDC, JICA , WFP and the Rotary Club of Hong Kong Sunrise. EPWG then discussed its Work Plan 2017 and the Strategic Plan 2017-2020 that had been discussed intersessionally. The two plans guiding the activities of EPWG were formally endorsed. Economies then reported the updates of recent natural disasters and major DRR policies including a report by Mexico about the 2017 Global Platform for Disaster Risk Reduction scheduled in May in Cancun. ADRC made the final report on the tsunami workshops organised last year, gave also updates of the Kumamoto earthquakes last year, in particular, regarding ADRC study visits to the affected area organized last December with the participation of officials from DRR ministries from its 23 member countries. ADRC also reported about the implementation of an APEC project, "Enhancing Rural Disaster Resilience through Effective Infrastructure Investment" and invited participants to discuss the concept of Build Back Better. Based on the discussion, ADRC together with Vietnam organised a kick off meeting in Kobe, Japan, 13th-14th March. The second meeting of EPWG in 2017 will be held in Ho Chi Minh City in August.